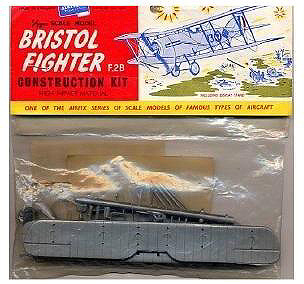 With many variations, this Airfix Kit produces a detailed model of the Bristol type fighter, or "Brisfit" as it was commonly known. It proved to be one of the outstanding aircraft of World War I and was in fact still retained in service with the British and foreign Air Forces until about 1930. 1988 Edition - listed as both 01005 and 01080 Special Edition Vintage Aircraft.